Two-year-old Emma LaVelle wanted to play with the other children, but a congenital disorder prevented her from using her arms. 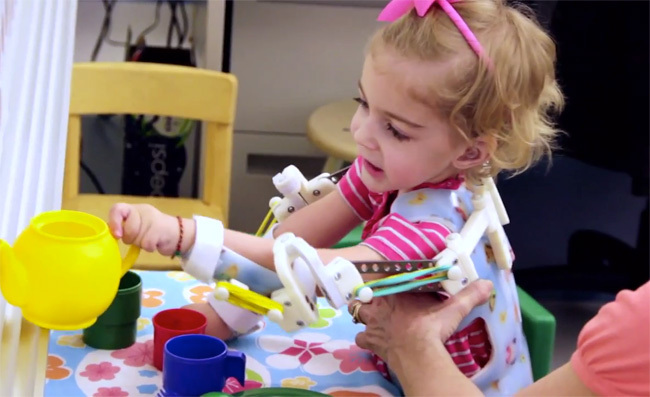 Now, with the help of 3D printing, Emma can lift toys and draw pictures with her friends. Stratasys, a pioneer in Fused Deposition Modeling (FDM) and 3D printing, has worked with Emma’s doctors at Alfred I. duPont Hospital for Children to create a custom plastic robotic exoskeleton that allows Emma to overcome her disorder. Emma was diagnosed with arthrogryposis, a condition that limited the use of her arms due to underdeveloped muscles. But that doesn’t stop Emma, who calls her exoskeleton her “magic arms.” Using 3D printing technology, the jacket can be adjusted as Emma grows – and printing replacement parts when something breaks is quick and easy. Emma is currently on her second jacket, and her first complete sentence was “I want that” when her jacket was temporarily removed for adjustments, a moment that highlighted just how much Emma’s life has changed due to the technology. Stratasys first began developing FDM in 1988 and it has stayed on the forefront of 3D printing ever since. The development of 3D printing has helped to solve numerous problems with producing 3D objects, including shortening production time, eliminating errors and allowing for the development of objects that couldn’t be imagined before. To illustrate this, Stratasys is updating their Facebook page throughout August to show what 3D printing can do for the world. Via Venture Beat and Yahoo! i dont get how this device works..how can it assist her if she cant move her arms in the first place? Bravo ot Emma for being open to using this new device/invention. I love this story of success! I don't know what I'd do if I had a similar handicap, I play fiddle and my mom comments on how I use my hands to talk. We are gently reminded here how important our arms and hands are!